If you’re considering one last California adventure on the river with us, you might be surprised to learn that we still have options available for fun whitewater rafting trips until the end of October! During September and October, rafting trips are only available on weekend days (see river specific schedule below.) And if you’re worried about water, there’s no need. Even during the drought, water stored in upstream reservoirs is released on a schedule to generate hydropower, provide water for drinking and irrigation–and gives the tax paying public the bonus of reliable flows for recreational whitewater boating! 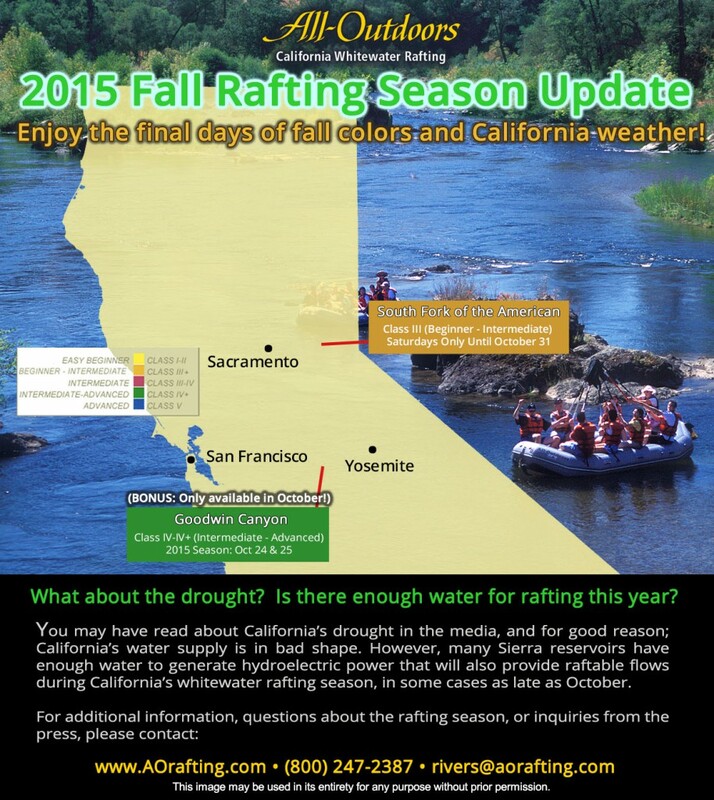 To learn more, read our post When in Drought, There’s Still Water For Rafting! Of course we’re also happy to answer any questions you might have, so don’t be shy. Just call, email or use Live Chat! Or, if you already have a trip in mind, you can Check for Available Space to see if we have the trip you’re thinking about. Which California River Trip Will You Choose? South Fork American River: A classic California river with itineraries enjoyed by guests age 5 to 85 (maybe even older!). Great for groups with mixed skill and experience levels. Not far from San Francisco or Lake Tahoe! BONUS: Goodwin Canyon (Lower Stanislaus River): The closest Class IV+ whitewater rafting river to the San Francisco Bay Area, this hidden gem will have a special release that occurs to coincide with the annual Salmon Run. Learn more about our Goodwin Canyon Double Days rafting trips.